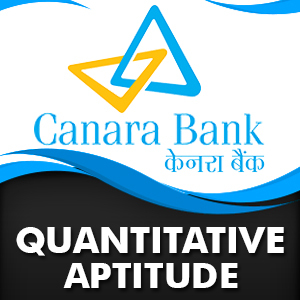 Mahendra Guru December 08, 2018 Important Quantitative Aptitude Questions For Canara Bank PO, Quantitative Aptitude Ability For Canara Bank PO, Quantitative Aptitude questions. Here, we are providing you important questions of Quantitative Aptitude for Canara Bank PO 2018 exam. Q1. A and B working separately can do a piece of work in 10 and 16 hours respectively. If they work for an hour alternately and A begins, in how many hours will the work be completed? A और B अलग -अलग किसी काम को 10 और 16 घण्टों में क्रमशः कर सकते हैं यदि दोनों एक - एक घण्टे एकान्तर क्रम में A से शुरू करें तो कितने घण्टों में कार्य समाप्त होगा? Q2. Manish sold an item for Rs. 5200 and incurred a loss of 20%. At what price should he have sold the item to have gained a profit of 25%? मनीष ने एक वस्तु 5200 रूपये में बेची और जिसपर 20% की हानि हुयी। वह उस वस्तु को कितने रूपए में बेचे जिससे उसे 25% का लाभ हो? Q3. There are 2560 students in a collage. Out of which 35% got passed. What is the respective ratio between passed and failed? किसी विद्यालय में 2560 छात्र हैं। जिनमें से 35% उत्तीर्ण हुए। उत्तीर्ण और अनुत्तीर्ण विद्यार्थियों के मध्य क्या अनुपात है? Q4. What would be the compound interest on an amount of Rs. 92500 at the rate of 8% per annum after 3 years? 92500 रूपए की राशि पर 8% प्रतिवर्ष की दर से 3 वर्षों बाद चक्रवृद्धि ब्याज क्या होगा? Q5. The length of a rectangle is decreased by 2x% and the breadth increased by 10%. Find the value of x if the area of the rectangle is unchanged? एक आयत की लम्बाई में 2x% की कमी और चौड़ाई में 10% की वृद्धि की जाती है, यदि आयत के क्षेत्रफल में कोई परिवर्तन नहीं हो तो x का मान ज्ञात कीजिए? Q6. What is the total number of employees in Production, Corporate and Research in all the years? सभी वर्षों में उत्पादन, कॉर्पोरेट और अनुसंधान में कर्मचारियों की कुल संख्या क्या है? Q8. Total number of employees in Production and Research is how much more than the total number of employees in Corporate and Marketing? उत्पादन और अनुसंधान में कर्मचारियों की कुल संख्या कॉर्पोरेट और विपणन में कर्मचारियों की कुल संख्या की तुलना में कितना अधिक है? Q9. Total number of employees in Corporate is how much more/less than the total number of employees in Research? कॉर्पोरेट में कर्मचारियों की कुल संख्या, अनुसंधान में कर्मचारियों की कुल संख्या से कितना अधिक /कम है ? Q10. What is the average number of employees in Marketing, Research and Accounts? विपणन, अनुसंधान और एकाउंट्स में कर्मचारियों की औसत संख्या क्या है? Total time taken to complete the hr.